The bloody hand depicts the sharp rise in homicides in Ciudad Juárez between 2006 and 2010 (3,111 homicides that year). During much of this time period there has been a heavy military presence (up to 10,000 troops at times), patrolling the city's streets. Juarenses repeated time and time again throughout the weekend one of the main points of the above artwork: that people stop viewing Juárez as a city of simply statistics, and begin to view it as a city of human beings. A group of people from a Juárez neighborhood arriving to the central plaza to join the peace caravan on the evening of June 10. 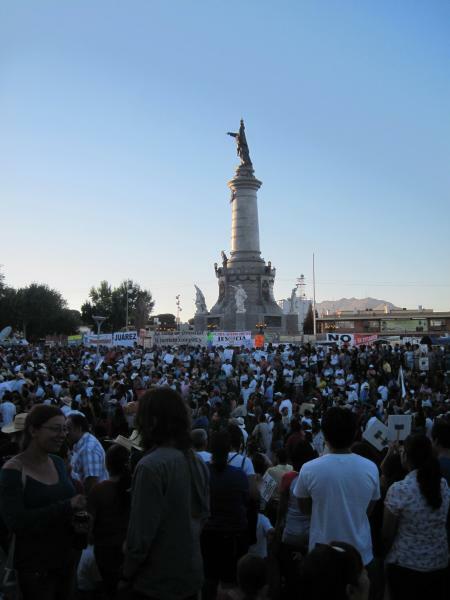 Thousands of people gather next to the Monument of Juárez to demand the end of the militarized war on drugs. Mexican poet Javier Sicilia speaks to the crowd. Sicilia, who lost his son to the drug violence in March, is one of the principal figureheads in Mexico's emerging anti-drug war movement. He shared the stage with dozens of drug war victims—people who have lost their daughters and sons, their brothers and sisters, their most intimate loved ones. Almost all of these people signed the national pact at the end of this emotionally-charged event. Even a resurrected Miguel Hidalgo, a historical figure from the 19th century Mexican War of Independence from Spain, was present in the caravan. It probably wasn't a coincidence that Mexico's national social pact for peace was signed within steps of the United States, given the U.S. voracious demand for illicit drugs and its militarized approach to "solving" the problem. The above cross, placed in front of the port of entry to the United States in Ciudad Juárez, reminds border crossers of the hundreds of women who have been killed in the city, and demands that there not be one more. As expressed by this woman in El Paso at a rally with caravan members on June 11, many in the United States are not happy with the U.S. support of Mexico's bloody drug war. 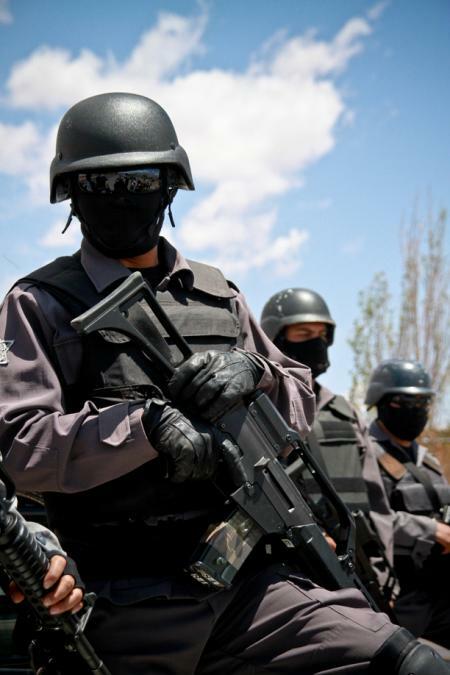 Between 2008 and 2010 the Merida Initiative has backed Mexico's drug war with $1.5 billion in funds. With $310 million in the works for this year, and $290 million for 2012 there seems to no end in sight. Mexico has surpassed Colombia as the number one recipient of U.S. military aid in the Western Hemisphere. 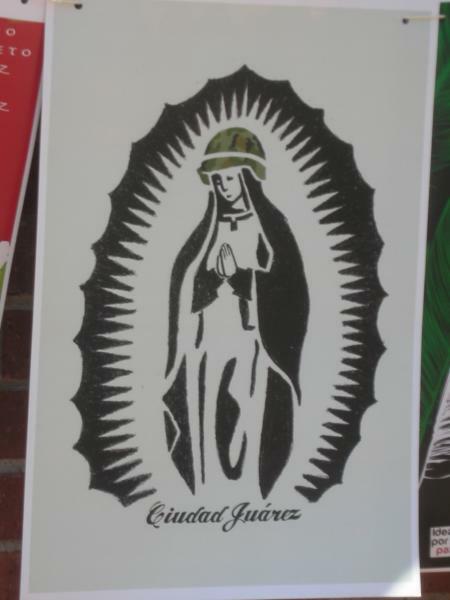 Despite this, U.S. support for this war in Mexico continues. One person I talked to who had lost several close family members to the drug war violence, wondered if her family might have been better off in "Iraq or Afghanistan." Much depends now on how the national social pact is enacted in Mexico, but at least for a moment there is a glimmer of hope in a brutalized Ciudad Juárez, in a militarized Mexico, that a new social movement is emerging that might stop the violence. As caravan participant Noemi Peregrino González told me, the signing of the pact could be "the beginning of the construction of a new history" for Mexico.